Several strips of scrap brass or copper, roughly .5” wide, and 8-10” long, starting at about 20 gage. For a Durston mill, a set of spring-ring pliers, and a long phillips head screwdriver. 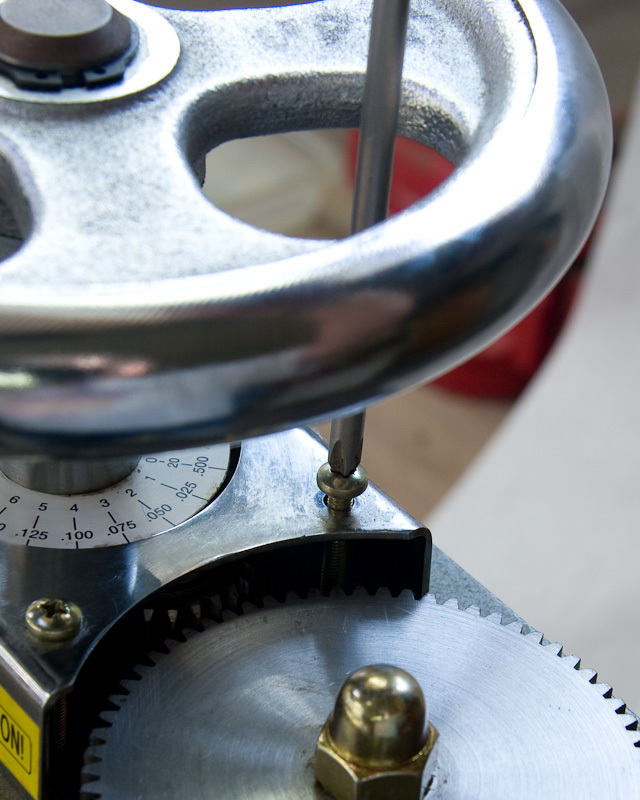 Most other mills don’t require any special tools to realign. Most of the images are rigged to expand into a larger slideshow view if clicked on. If you put your mouse into the right and left edges of the expanded views, you'll get next & previous buttons. The image to the right is the one exception. Rolling mills are wonderful things. 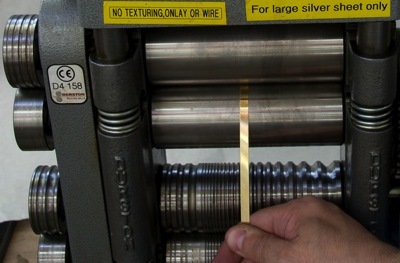 They allow us to roll thicker sheet stock down into whatever thickness we need. Generally, they’re hard to break, but if the user is careless, the rolls can become mis-aligned. This will result in sheet metal that curves to one side or the other as it’s rolled down. Fortunately, realigning the rolls, while tedious, is not especially difficult. 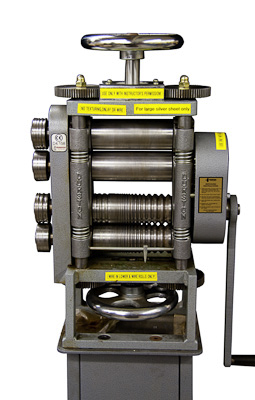 There is only one way that a rolling mill without structural damage can become misaligned: one of the two screws that applies pressure to the upper roll bearings applies sightly less pressure than the other. Generally, this happens because the screws have rotated out of synch with each other. If you examine most modern rolling mills, you will see the two large screws pressing down on the upper bearing blocks. The tops of these screws have large gears on them, and between these two large gears is another gear with a handle. 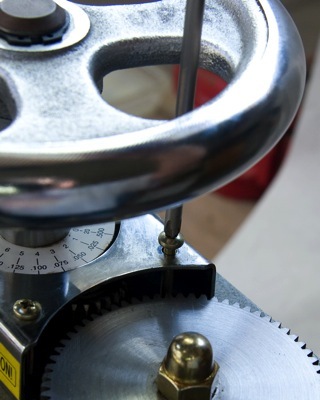 Turning the handle will force each screw to rotate in synch with the other, so that as one screw descends by one revolution, the other screw matches the motion exactly. This keeps the pressure on the rolls even, and produces straight, even sheet metal. The middle gear, the one with the handle, is there to be a handle, but far more importantly, it is there to lock the two other gears into synch with each other. 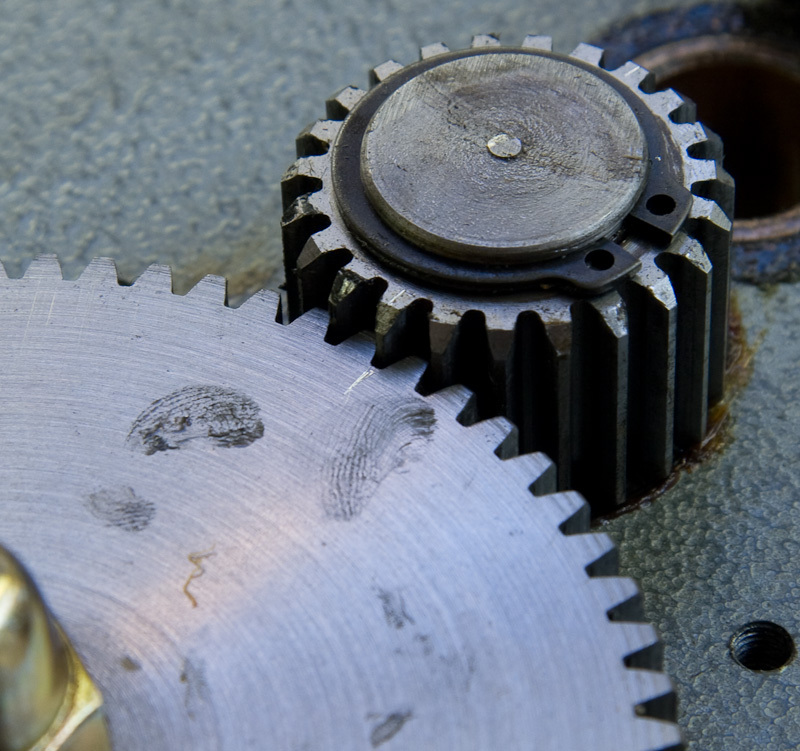 If for some reason, the center gear is removed, or the mill opened to the point where the screw gears unmesh with the center gear, the two screw gears can rotate independently of each other, and thereby exert uneven force on the bearing blocks, causing sheet that will curve towards the loose side. The best plan is to simply never take the center gear out. Ever. Unfortunately, there are occasions, especially in schools, where through the agency of mysterious gremlins, the rolls become misaligned, requiring us to make them right. 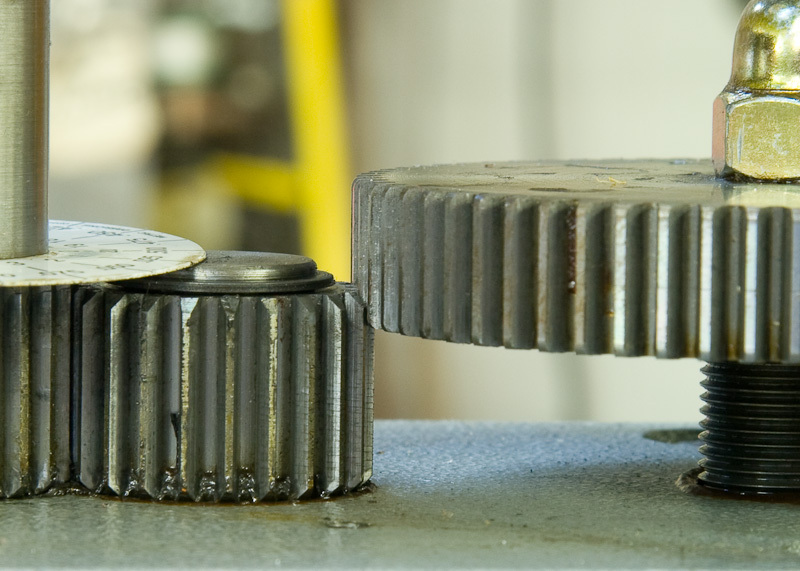 Older mills tend to have removable center gears, while more modern mills like the Durstons have center gears that are clipped into place so that they can’t be removed accidentally. 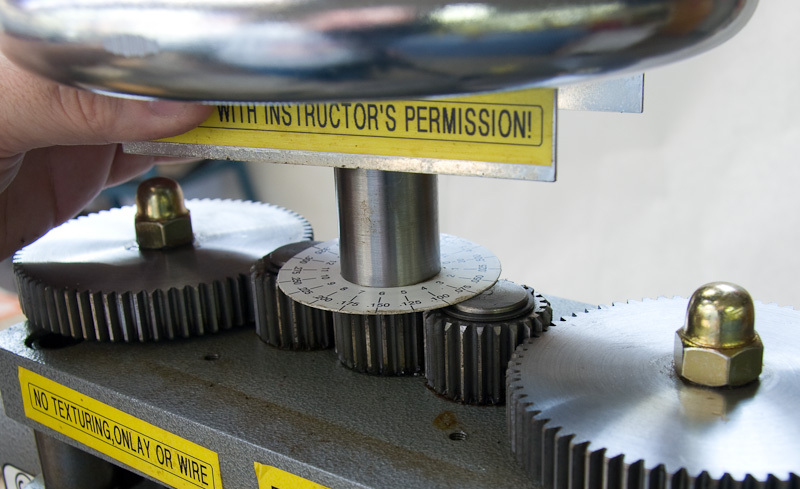 Even those can be misaligned if the rolls are opened so far that the screw gears rise above the height of the center gear. 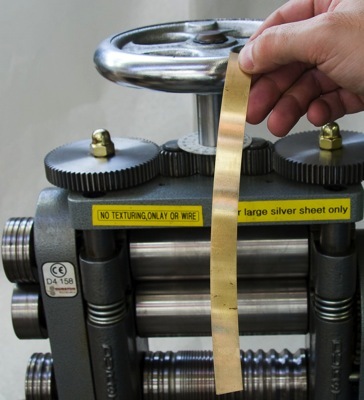 The final tab will show the procedure for realigning a Durston rolling mill, for two reasons: (A) because Durstons are a bit more complex than most, and (B) it happened to be a Durston mill that needed realignment when I decided to write this. Durstons have more coverplates and clips than most mills. These will need to be removed and replaced during the realignment. 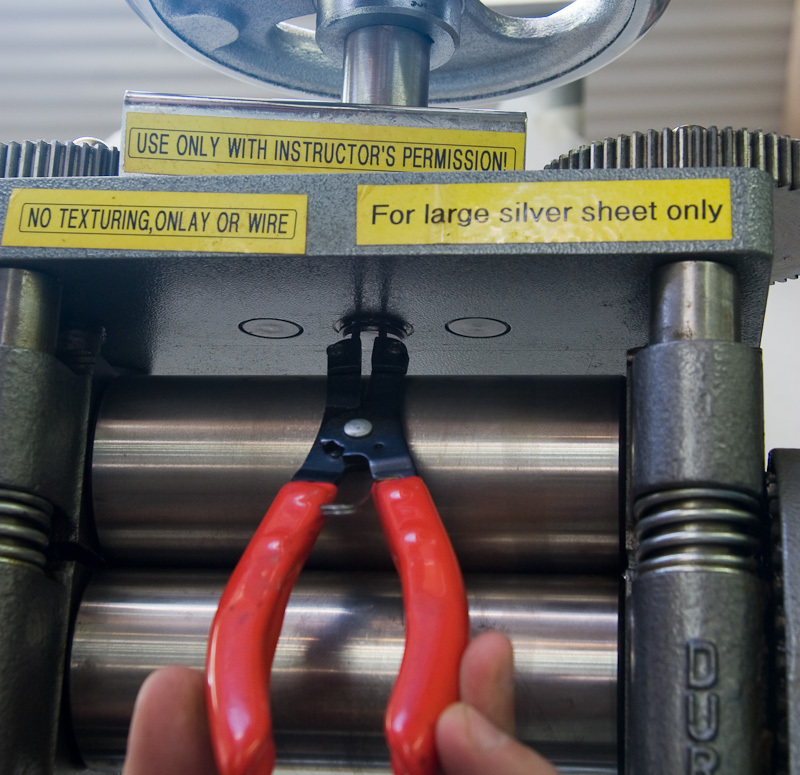 If your mill lacks these coverplates, ignore those instructions. Rough leveling. Use the central gear handle to get the rolls close to tight. Then remove the central gear, and wheel each screw gear down individually. The goal is to have the rolls touching, and have what feels like an equal amount of pressure on both upper screws. It doesn’t have to be much, just enough for you to feel that the rolls are touching, and that the tension on the screws feels about even. Reinsert the central gear. 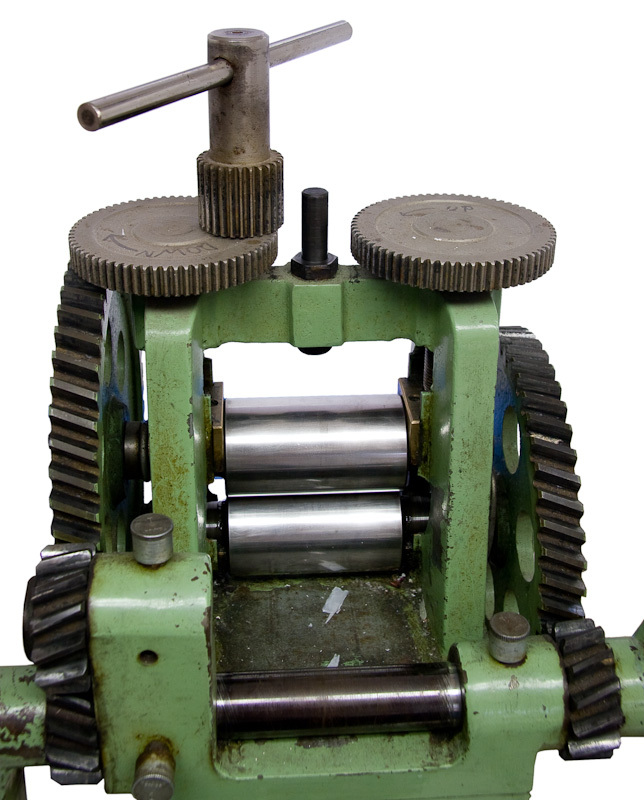 Traditional rolling mill with center gear removed. Never do this unless you're able to fix the problem you're about to cause. A Durston mill with the center gear removed. manually cranking the left screw down to correct the mis-alignment shown below. Test strip. 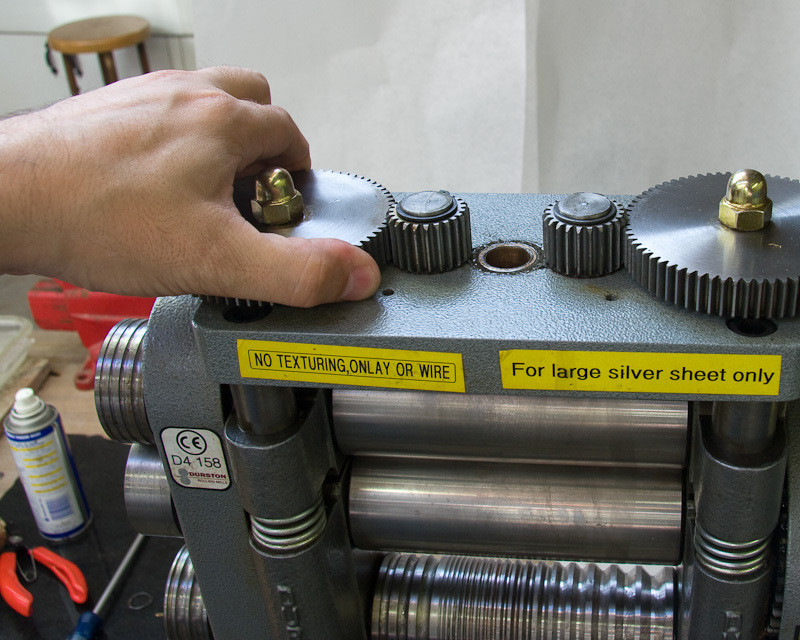 Using the central gear, open the rolls far enough to accept one of your test strips. These should be thin strips of copper or brass, roughly 6-8 inches long, one quarter to one half inch wide, and 18 or 20 gage to start. It doesn’t much matter what they are, so long as they’re long, thin, and straight. 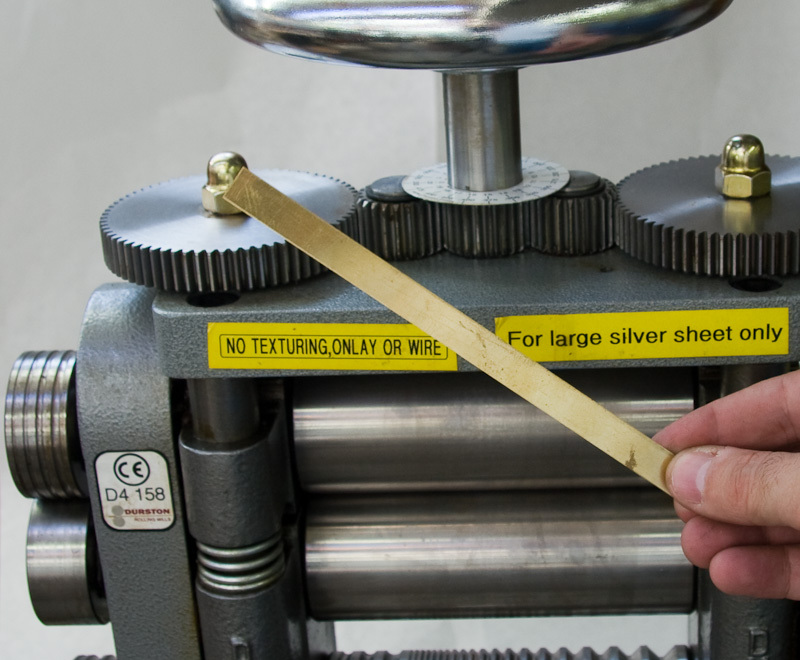 Use the central gear to tighten the rolls enough to take a modest reduction on the thickness of the test strip. 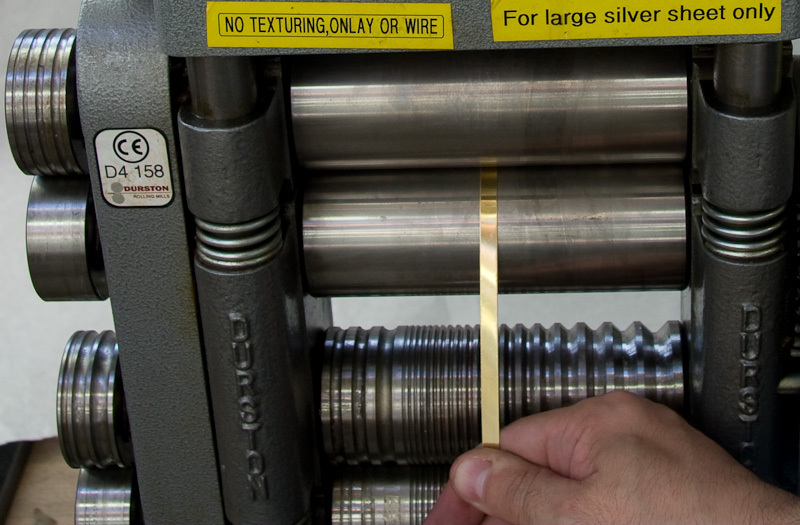 Feed the strip into the center of the rolls, making sure that it goes in straight. I’ve found it helpful to pull back on the strips after the mill grabs hold. The tension seems to help them go through straighter. Watch what happens when the strip comes out the other side. If it’s straight, you’re done. If it curves towards one side, that side is the loose one. If it curved, flip it over so that it’s curving the other way, and run it back through the center of the mill, changing nothing. That should straighten it out enough to use again. Feeding a test strip through the mill. put it through the center, and make sure it goes in straight. pulling back on it once the mill bites helps this. The first test strip. The rough adjustment wasn't so OK was it? One Step at a Time. Remember which side the metal curved towards on the first pass. That’s the loose side. 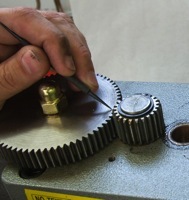 Lift the central gear enough to allow you to turn the screw gear on that side. Rotate it clockwise (tighter) by one gear tooth, and then reinsert the center gear, making sure the other side hasn’t moved at all. Roll another test strip. If it comes out straight, you’re done. 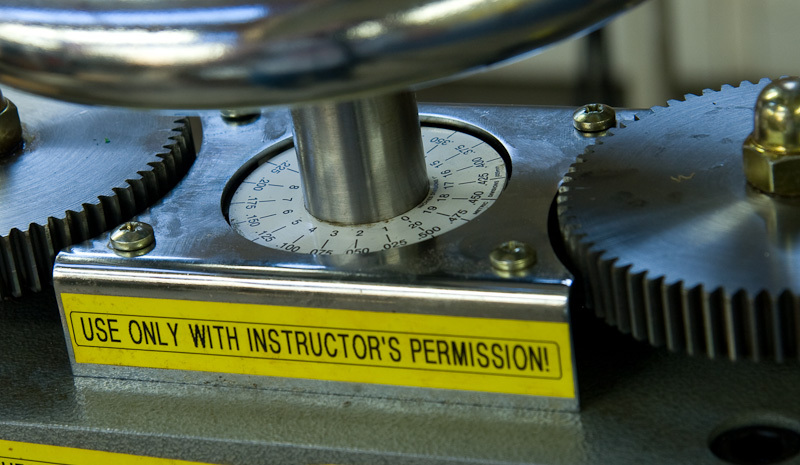 If not, repeat this step, advancing in increments of one gear tooth at a time until the metal does come out straight. If the strips start curving the other way, you went too far. Back off by one tooth, and try again. This can be tedious, but it’s not especially difficult. On the first few passes, if I know the mill is still badly misaligned, I will advance the gears by two or three teeth per pass, until the strips start coming out straight enough to make me think it’s close. The second or third pass. Not so bad this time. Looks like I over did it, and now the left's too tight. Trust but Verify. Once you’ve got a strip that comes out straight, double-check yourself by opening the rolls, and then retightening them to take a bite on a fresh strip. Roll several passes on it, getting progressively tighter. If the strip stays straight, you’re done. If not, go back to steps two and three. Try not to think about Sisyphus. Once you really do have the rolls realigned so that the strip will stay straight through several passes, you’re done. Do whatever you need to put your mill back together, and then don’t ever take the central gear out again. It is possible to have a mill that never quite comes out straight. Older mills, or bandit brand mills sometimes have slight misalignments built in, generally because of wear, or the builder not understanding how critical it was that the rolls be exactly parallel. Once you’ve gone through several passes where the strips alternately curve right and left over a difference of one gear tooth, it’s time to decide how close is ‘good enough’. 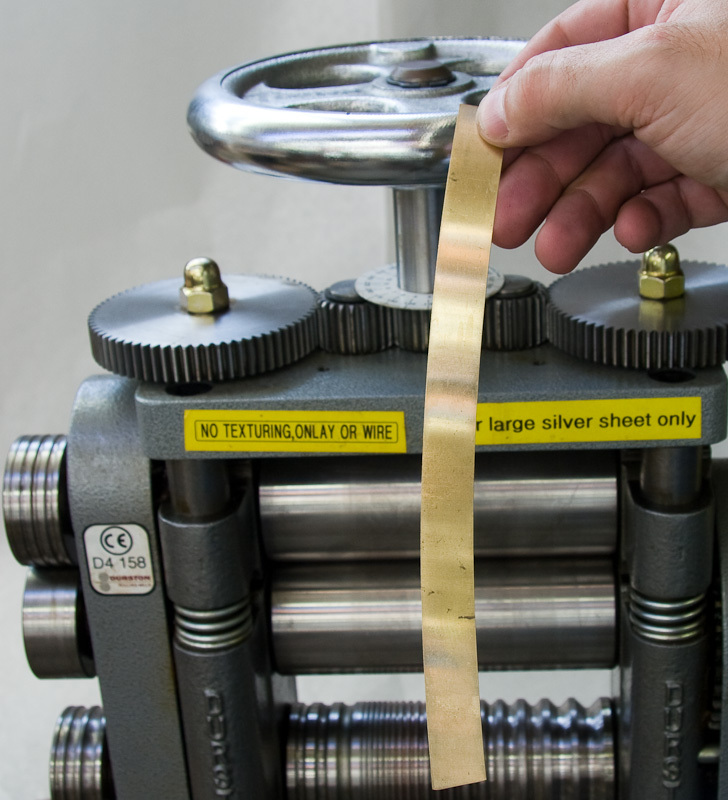 An old trick to compensate for older or misadjusted mills is to flip the metal right-for-left between passes, so that any misalignment in the rolls is evened out. That’s generally good enough for most things. Final test strips. These started out at about 6" long. They're now nearly 12 inches. The top one is essentially straight, it's just sitting on the ruler crooked. The bottom one varies by about 1/8" in a foot after a 50% reduction. This will get you back into the ballpark quickly if the gremlins mess up your mill again. Durstons are very good mills, but they've got more bits & pieces than most traditional mills, so there's more to take apart to work on them. and has a plate covering the idler gears. This must be removed before you can remove the center gear. Wide Durston mills have a pair of idler gears in between the center gear and the screw gears. If they used the traditional 3 gear setup, all three gears would have to be huge to span the width. This setup functions identically, it's just more compact. making it impossible to remove accidentally. Alas, nothing is foolproof to a sufficiently enthusiastic fool. Remove the spring ring from the bottom of the center gear shaft with spring-ring pliers, set to expand. If you can't pull out the center gear, you can open the rolls so far apart that the screw gears rise above the tops of the idler gears, and unmesh that way. I'd just managed to get it realigned when I thought to take this picture. Do you think I was going to unmesh them, and have to realign, just for a picture?? This particular mill is an early 2000's model. Apparently more recent mills have coverplates without the cutouts, so that the gears can't rise far enough to unmesh. Somehow, I don't think that'll be the end of the story.